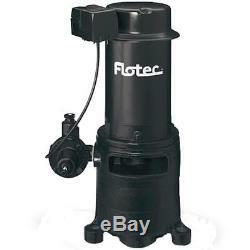 Flotec FP4432 - 12 GPM 1 HP Cast Iron Vertical Deep Well Non-Submersible Pump (115/230V). Cast Iron Vertical Deep Well Pump. Vertical deep well jet pump can be used in 4 diameter or larger wells up to 260. Vertical deep well jet pump can be used in 2 diameter wells up to 180. Depths to water of 50' or more. Up to 12 gallons per minute at 50 PSI. Preset at 230V, also allows for 115V. 1-1/4" suction, 1" drive, 1 discharge. Prewired Factory-Set 40/60 Pressure Switch. Pressure gauge and mounting feet also included. Power Equipment Direct was founded on the premise of simplified shopping. Exceptions include some handheld lawn tools. Boxes or APO/FPO addresses at this time. Each item which this applies to, will contain information in the respective listing description information. Thank you for your time and understanding regarding this topic. In some rare instances, you may need some help with a return. Simply contact our Customer Service team in order to discuss return options for unopened merchandise. Simply contact our Customer Service team in order to discuss return options for opened merchandise. If the product has been gassed or oiled, it needs to be taken to an authorized service center. Concealed damage claims must be reported immediately. On occasion, the outer carton may look damaged, but the product inside the box is perfectly fine. Do not sign for damaged products. If you think your product is defective, don't worry. The item "Flotec FP4432 12 GPM 1 HP Cast Iron Vertical Deep Well Non-Submersible Pump" is in sale since Wednesday, February 8, 2017. This item is in the category "Business & Industrial\Hydraulics, Pneumatics, Pumps & Plumbing\Pumps & Pump Accessories\Pump Parts & Accessories\Other Pump Parts & Accessories".